Hi I’m Sande and I just had to share with you how easy it was to plan my wedding on Engaged Now What? There are so many great things about this site that will help you plan your upcoming wedding. You’ll find a calendar of bridal events, amazing vendors and a list of wedding venues from Lake Tahoe to Napa Valley listed by Theme and by Region. 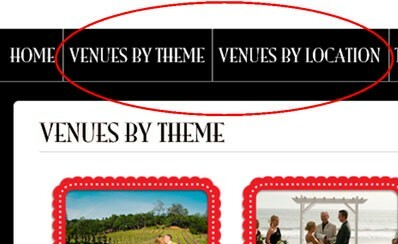 2 When searching for venues there are two options to search by: Venues by Theme & Venues by Location. If you want to get married in a vineyard but the city isn’t top priority, you have the option to search all wineries in Northern California. It’s so simple and convenient. 3Each venue and vendor website is listed and you can click on the link to go directly to their website. 4When setting up appointments with venues, the address listed for the venue links you to googlemaps.com. Here you can find simple directions while on the go. My favorite thing about the website is while I’m browsing at work (shhhh! Don’t tell) I can add venues and vendors to My Binder. You can do this by clicking on the “Add to My Binder”. This works great because when I get home I can share my favorites with my fiancé without having to go through the website and try to find them all again. 7Sometimes you want to share what you found on the site with the world of social media. They make it very easy to do this. All you have to do is click on any of the links under the venue or vendor to share on your facebook, twitter and so much more. 8The Wedding Binder Vendors and some of the premier vendors have heart shaped icons to visit their social media pages. This way you can find out more about them by visiting their fan pages. 9The calendar of events is great for finding all your local open house, bridal shows or wedding events in Northern California. Make sure to check in regularly because new events are added all the time. 10The inspiration page is great for getting ideas and browsing pictures. Feel free to pin any pictures you see like to Pinterest or add the entire category to you wedding binder. And that’s the website in a nutshell! Remember to sign in and create your account. Congratulation on your engagement and happy planning!